When Shaun was first telling me about this trip several months ago, he mentioned what a challenge it would be for those bloggers who will try to describe it adequately. He explained that the poverty on the streets of Calcutta is like no other poverty in the world, so vast is its scope. Please join in me praying for these bloggers–for their safety, for their families back at home, for their own hearts as they try to tell us some powerful stories. I am following several of the bloggers who will be on this trip, and Compassion is such an awesome organization!! These folks need our prayers to be sure. They will all be in my prayers. What a great idea. I love people with a heart for others and those that hold so much compassion. The Lord truly loves their hearts. Thanks for shaing this information. I’ve posted a button for this program. Blessings to you. Shannon, you’re so right – this IS the power and the good of the blog world. I blogged about it today – and told you a bit about it earlier this year – but reading the blogs of the folks who’ve gone on the last two Compassion trips has changed my heart. And I’m pretty sure, changed my life. Did you not post about LOST this week because it was just a recap? 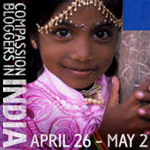 Thank you for spreading the word about the Compassion India trip! I’m really excited to see where they go in Kolkata — my daughter (who’s been home with us for 16 months) was born there. We just started another adoption, and we’re praying our next daughter will be from the same orphanage. Wow…what a wonderful project. I’m excited to see what they blog about. We will keep them in our thoughts and prayers. I agree, what a wonderful project! Bloggers really know how to pull together for a great cause. I spent my spring break reading “City of Joy”, and the incredible generosity and love of the poor of Calcutta was amazing to read. This is a book I will revisit at least once a year . . . it keeps me humble.